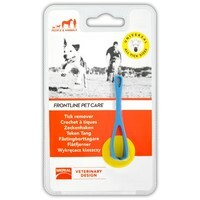 The Frontline Pet Care Universal Tick Remover has been designed to be used on any and all sizes of tick. Designed to be used with a simple 'twist and lift' action, it will remove the entire tick safely and completely without squeezing the body (prevents disease transmission, e.g. babesiosis) or leaving mouthparts behind (helps prevent local reactions and infection). Safe for use on both animals and humans, the Frontline Universal Tick Remover also has a convenient key-ring hole so it can be kept handy for when it's needed.